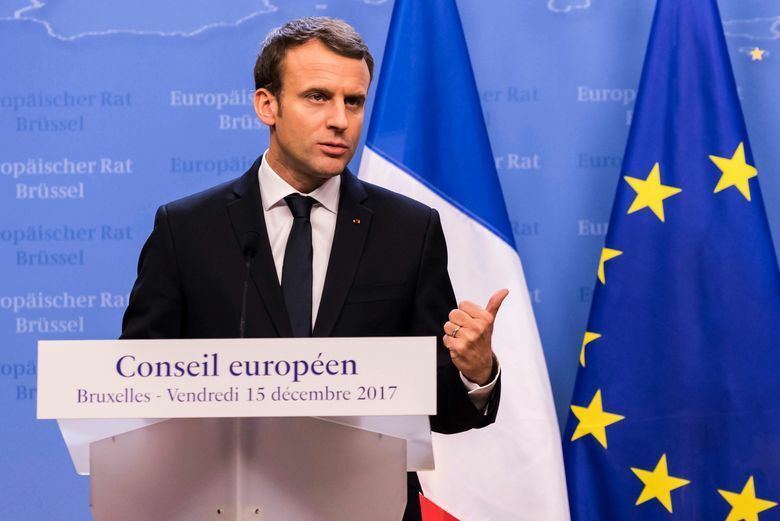 PARIS (AP) — French President Emmanuel Macron thinks the Islamic State group will be defeated in Syria by the middle or end of February and that Syrian President Bashar Assad can’t be ignored in the aftermath of a military victory but must one day answer for his crimes, according to a television interview that aired Sunday. U.S. President Donald Trump was not invited to the summit because he plans to pull out of the Paris accord. Macron said Trump’s failure to respect an agreement signed by the United States during the Obama administration and to recognize the climate deal’s benefits for his country were both mistakes. Macron called the summit under the banner of “Make our planet great again,” mimicking Trump’s “Make America Great Again” campaign slogan. During the TV interview, he noted that he was 39 years old when he was elected seven months ago, a man “who came out of nowhere” to secure a victory that “wasn’t expected.” His opponent in the presidential runoff, far-right leader Marine Le Pen, awakened a “profound fear” among French voters, Macron said. Macron took some criticism for his trip this weekend to the opulent Chambord Chateau with his family, with remarks that it recalls the royalty of French monarchies. He described the visit as an early Christmas gathering — not an early birthday party as rumors had it — and noted in a radio interview that the family paid for its stay in a bungalow.